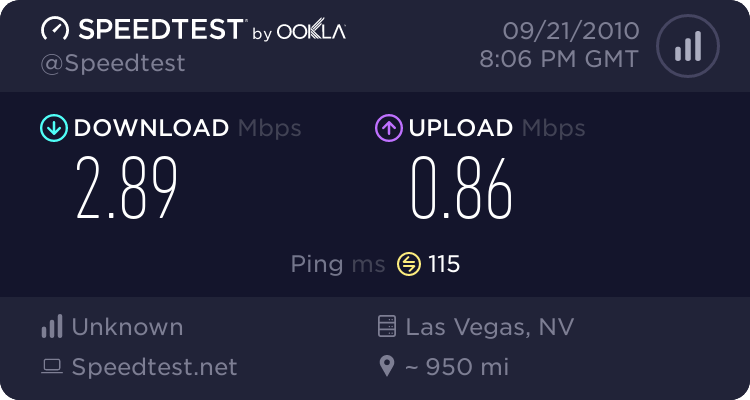 Here we go again with another completely unscientific, off-the-cuff, single-moment test of Clearwire’s WiMAX wireless broadband service against free Wi-Fi services from AT&T and Starbucks, this time in Las Vegas where Clearwire has been operating WiMAX commercially for more than a year. If you didn’t see our first test of WiMAX vs. Wi-Fi you missed a lot of spirited conversation (most of it here at MuniWireless). I thought (and still think) many people missed the point by trying to convince me that the test wasn’t a fair match of technologies, the results inconclusive, etc. While I agree that the tests are unscientific — I even said so, like I am doing again here — that doesn’t mean I think they are useless. Instead I look at them as not just isolated events but instead as the seeds of what I hope will be a groundswell of regular folks testing the services they pay for or use for free, to provide as many data points as possible for all of us to make better, more informed broadband purchasing decisions. Sure, it’d be way better to test every Starbucks in existence or every place where you might want to use WiMAX from Clearwire. But I am only one guy with a beat-up old laptop. You gotta start somewhere, and for this post somewhere is just west of the Vegas Strip, at a Starbucks on Flamingo right next to the Palms casino/hotel complex. 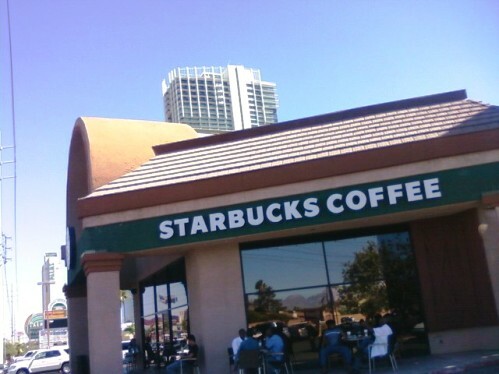 That big white building behind the Starbucks is the Palms Place hotel, the new Sidecut Preferred place to stay while in Sin City, for its non-casino lobby, its mini-kitchen suites and close/easy/free parking. And just past the Loose Caboose local casino in the Arville Plaza is this strip-mall Starbucks, where unlike casino-based outlets you can actually get a cup of joe in the morning without waiting in hundreds-long lines. This is a slice of the real world, a fairly normal Starbucks like anywhere else in the USA, with lots of folks camping out on the free Wi-Fi. So how did that AT&T wireless link perform, even though all the tables were crammed with online customers during my entire half-hour visit? Pretty stable, at around 1.35 Mbps on the download. In my (completely unscientific!) tests so far it seems like ~1.5 Mbps is about the best or worst you can expect from a Starbucks/AT&T connection, which in my mind is pretty darn good — if you can rely on those speeds everywhere you go, the FREE FREE FREE (did I mention it was FREE?) Starbucks/AT&T service may be all you ever need, along with one tall drip coffee ($1.50 to $1.85) that you can nurse ever so slooooooowly. You might also try one of the old-fashioned donuts. We did. So how did the WiMAX service perform in the same locale? 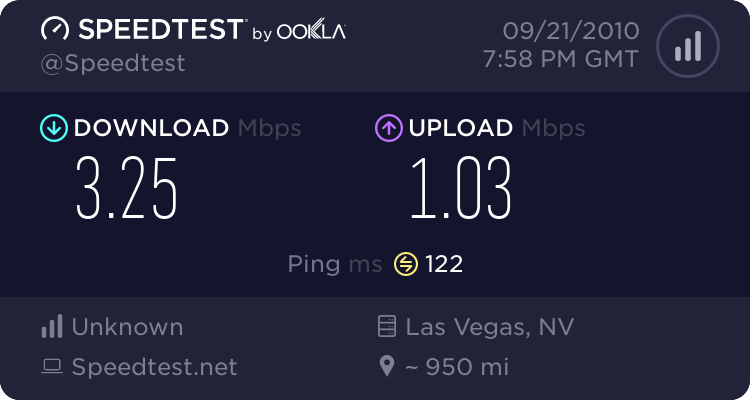 The Clearwire service, which costs $55 for 3G/4G hybrid service (like I get on my USB modem loaned to me by Clearwire) or $40 for just WiMAX, was essentially twice as fast as the “free” Wi-Fi on the download, and a bit slower on the upload. If you drill down for a close-up of this area on the Clearwire coverage maps you see it designated as a lighter green or not “the best” area for coverage, perhaps due to the proximity of the Palms complex (correct me if I’m wrong but it is my general understanding that big, metallic buildings can wreak RF havoc). Either way, WiMAX still “doubles down” on Wi-Fi in this single-epsiode test on one machine at roughly a little past noon. It’s not a big-stick whooping like our first test in Mountain View but still a pretty good real-world result, especially indoors. To sum up and perhaps address complaints before they happen, here’s what the test was NOT: It was not an rigorously engineered bakeoff of wireless technologies in a lab; it was not an attempt to say “WiMAX is better than Wi-Fi;” it was not an attempt to find the best wireless value or the best place to connect in Las Vegas in one roll of the online dice. Instead — it’s just a single glimpse at the data we were able to collect, on our own dime and time (along with the free/loaner services provided by Clearwire). The conclusion? Commercial WiMAX seems to be delivering pretty much as advertised, supporting download speeds that can easily double the Wi-Fi signal found inside a Starbucks. Use the results as you wish, but remember since we are a California concern: No wagering. Starbucks is not by any stretch, the poster child for WiFi, these tests are useless because we know that 90% (if not more) of the backhaul links are T1 lines. You will as a result never see a test at starbucks higher than 1.5Mbit in either direction….period. Since you’re in Vegas, why don’t you go test a real wifi network, Cheetah Wireless. Either that, or change your title to a more fitting one, like “Clear doubles down on Starbucks in Las Vegas”. Side note, how much did Clear pay you to write these pieces? Paul – thanks for this. I find your real-world analysis just fine, so thanks for sharing the results. I’d be interested to know how the new MetroPCS LTE network in Vegas compares. Looks like they announced a launch in Dallas today. More to the point though, Clear needs to hurry up with the Bay Area launch! Jim, thanks for the kind words. 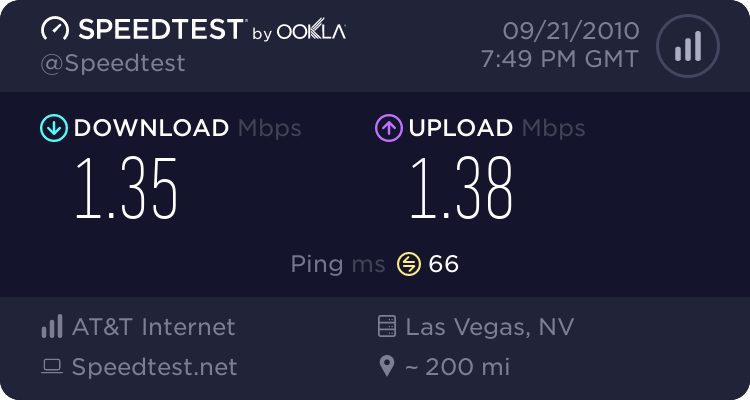 I did test the MetroPCS phone — didn’t get through to Speedtest but it seemed to have response times like a regular 3G phone. Nothing “screaming” about it. MetroPCS won’t provide any download data and they are only using 5 MHz channels, so it’s probably not anything to write home about (though ostensibly a good bargain, $55 unlimited data/text/voice, $299 for the phone). D&C — I didn’t test Cheetah because Cheetah doesn’t have easy-to-find shops where you can sit down, have coffee and Wi-Fi like Starbucks. I pick Starbucks because they are an obvious choice anywhere for anyone looking for a place to get online. And the tests aren’t useless (unlike your comments) since they do show whether or not Starbucks is delivering to their capacity. As for your “side note” if that is the best insult you can muster your creativity is as lacking as your ability to understand what we’re doing here. I guess Dazed and Confused is really a good anonymous title for you after all. I just took the speed test. I have had clear wire for 1 year and 5 months in Las Vegas. I live at LV Blvd & Nellis Blvd. Download 0.43 Mbps, upload 0.07 Mbps, 30 Oct 2010 @10:00 PM. I pay for 3.0 Mbps but never see it. I wonder how can other countries deliver 100 Mbps for about the same price but here in the US they can’t? The 100 Mbps speed you mention is delivered via fiber, not wireless. Other countries are able to do this for a low price because (a) the fiber networks are subsidized by the government or (b) there is a lot of competition in the broadband market. Singapore, for instance, financed its FTTH network using public funds but it allows any ISP to deliver service to end users, causing price competition. How does WiMax perform in urban canyon ? And when can we start buying WiMax modem or radio.